On 16 June 2011, domestic workers and supporters from around the world unfurled a banner from the balcony of the grand United Nations Assembly Hall in Geneva, Switzerland. It read “C 189 – Congratulations! 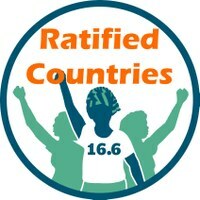 Now comes the domestic work for governments: RATIFY – IMPLEMENT!” In the hall below, supporters in the official delegations of governments, workers and even some employers clapped and cheered. It was a truly historic moment. The overwhelming vote for ILO Convention No.189 on Decent Work for Domestic Workers (C 189) came after decades of struggles by domestic workers’ organisations for recognition, rights and respect. It was also the result of two long negotiating sessions at the International Labour Conferences (ILCs) of 2010 and 2011. Some employers and governments argued heavily against us, but others supported us, and we had an excellent negotiator heading the Workers’ Group, Ms. Halima Yacob from Singapore. This international treaty now acknowledges domestic workers as equal to any other wage earners. C 189 brings us international recognition and dignity, where previously we were unrecognised and undervalued, though we number millions in the world and are mostly women. It was only five years ago that domestic workers’ organisations from around the world met for the first time. It was at a conference in 2006 in Amsterdam, Netherlands, organised by labour organisations including the Dutch-based NGO IRENE, the Dutch union federation FNV, the food and allied workers’ global union IUF, the global research-policy network Women in Informal Employment: Globalising and Organizing (WIEGO), and the Committee for Asian Women (CAW) and supported by the then ICFTU. There, we decided to demand an ILO Convention. But we made it clear this would be only one step, albeit important, in protecting domestic workers. We would also use it to build a global movement of domestic workers. Two years later, domestic workers’ representatives from different regions came to Geneva. They decided to form a Steering Committee, supported by a technical team, to take the plan forward. Domestic workers want to speak for ourselves. Our demands had to be reflected in the Convention. But we also needed the Global Unions to help us. The ILO process is very formal and we couldn’t do it on our own. Happily, the IUF gave our network an organisational base. WIEGO also gave a lot of advice, and helped to raise funds. We started to send out awareness-raising materials to contacts worldwide. In the same period, the Workers’ Group at the ILO, which is made up of trade unions, got ‘Decent Work for Domestic Workers’ on the agenda of the ILC, to start in 2010. They found support from some Latin America and Africa governments, as well as professionals in the ILO. Then the official process started. All governments of the world were asked to submit reports about laws and practice in their countries on domestic workers’ employment rights. Technical experts drew up more reports, and produced a draft Convention and an accompanying Recommendation for the ILC to discuss. We worked closely together with the ITUC, which acts as the Secretariat for the Workers’ Group in the ILO. Our demands were included into the model answers to the questionnaire, which the ILO sent out to governments, employers’ associations and trade unions. Before those discussions started, network Steering Committee members went to the ILC in 2009. It was a training exercise, to be better prepared for the ILC the following year. Internal meetings also led to the launch of the International Domestic Workers’ Network (IDWN). Meanwhile, domestic workers took initiatives at every level to influence trade unions, governments and employers’ associations to recognize our demands. Our campaigning drew media attention. The plight of domestic workers was on TV, radio, the Internet, and in the newspapers around the world like never before. Our organisations grew in strength and capacity. In Kenya, the domestic workers’ union KUDHEIHA increased in membership from just nine in 2008 to 13,000 three years later! Many conferences and workshops were organized at all levels which we used to make our voices heard. The ITUC included us, in particular, in preparation workshops prior to the ILO Conferences, so that we could make sure that the trade union representatives would take up our concerns and demands. Most importantly however, we lobbied to be included in the official union delegations to the ILC, so that we were negotiating on equal terms with the government and employers’ delegates. The strategy was successful. A lot of our leaders had full voting rights. We also filled the Observers’ Gallery so that employers and governments knew we were watching their every move. Many factors played a role, and many organisations have been involved in achieving our Convention. But it was the direct participation of domestic workers which was crucial. The next stage is to get governments to put C189 into national legislation, and to make sure the laws that give us rights and protection are implemented. To succeed in doing this, the same collective force must be in place. At the Steering Committee meeting in Accra, in December 2011, we decided to work together with the ITUC in the 12 by 12 campaign, meaning that we campaign for twelve ratifications of C 189 in 2012. Beyond the twelve, we will in addition, focus on those countries, which have been supportive during the ILO negotiations and in which we have active domestic workers’ organizations. Only by building strong organizations of domestic workers, with broad based alliances, we will be able to make “decent work for domestic workers” a reality.